Great Way To Learn the Language! The pdf file given to aid in the learning process and the clear wording of the instructor. What was one of the most memorable moments of Italian Short Stories for Beginners? The translations in Section 15-on. 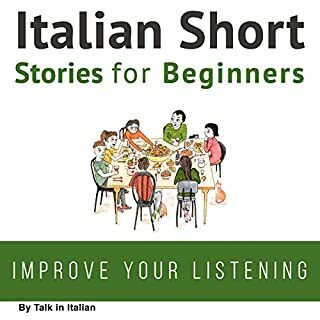 Italian Short Stories for Beginners is and incredible helper to learn Italian. Not only was the language spoken in clear, concise wording, but when the translation flashcards began in Section 15, I was able to remember what I heard and compare it to the language spoken. On top of that, the added pdf was extremely helpful for my visual learning to really get this down. Now I really can learn something I've always wanted to!